We photographed this Citroën 2CV4 in a back alley in Marseille, France. We were rather surprised to see it there because 2CV values have gone through the roof over the past couple of years and we figured every non-running example sitting on a public street had been snatched up by collectors and/or folks trying to make a quick buck. The registration number was issued in a neighboring department in 2007 so we can’t tell the exact year the 2CV was built in but the round headlights (or what’s left of them) indicate it rolled off the assembly line between 1970, when the 2CV4 was launched, and 1974, when square lights made a brief and generally unwelcomed appearance. Interestingly, the car is not instantly recognizable as a 2CV4 because it is wearing lots of 2CV6 parts including a red top, a full red interior and hubcaps on the steel wheels. The insurance and inspections stickers on the windshield indicate the 2CV was last driven in 2009 and it is safe to assume it has not moved since. A look in the trunk reveals the air cleaner box was removed so it might have been parked following a mechanical problem. 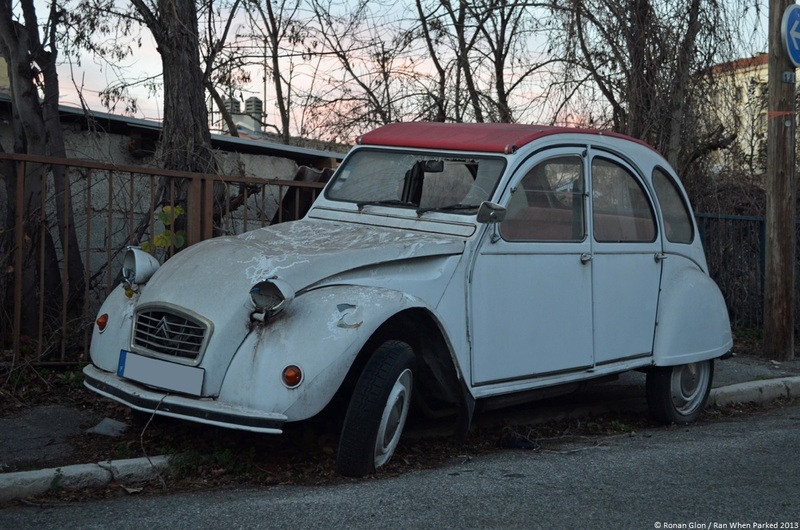 Since being left for dead on a sidewalk the 2CV has been the victim of vandalism (a normal occurrence in Marseille) and the windshield, hood, headlights and fenders have been smashed. Still, the chassis is sound and the body is not particularly rusty; it may not look pretty but it’s 100-percent salvageable. “More than just a car – a way of life”, let’s hope this individual is given a second chance. I left a note on it, I hope the owner will get back to me. It looks clearly like a stolen and abandoned car. Ronan is there any chance you could tell me the plate number ? I could trace the owner. I’m trying to track the owner, I’ll keep you posted. A friend of mine lives a few houses away, he’s helping me out. I would give it a good home, here in east Tennessee, It would look good sitting beside my BMW 2002’s and my 1600. I hate to see cars with even a little bit of potential left to rot away.